Bath’s Holburne Museum of Art, Bath, is a prestigious small art museum with a fine collection of paintings and decorative objects. The building is an elegant 18th-century villa situated at the end of the impressive Grand Parade. It was originally a smart hostelry, the Sydney Hotel. In the adjacent Sydney Pleasure Gardens, smart bucks and beaux would attend balls, concerts and gala events. Jane Austen lived opposite for a while; she enjoyed the gardens and fireworks but wrote somewhat critically of the musical entertainment. 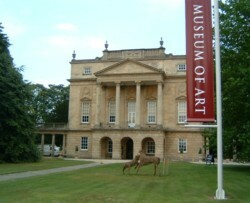 The museum is based around the fine art collection of a nineteenth century connoisseur, Sir William Holburne. The museum used to be known as the Holburne of Menstrie. It contains a wide range of items, from ancient Roman seals to silver spoons and Old Masters. Portraits on display include works by Zoffany, Gainsborough and Reynolds. The Holburne Museum is free to visit, although there may be a charge for the temporary exhibitions (some excellent) which the museum hosts.